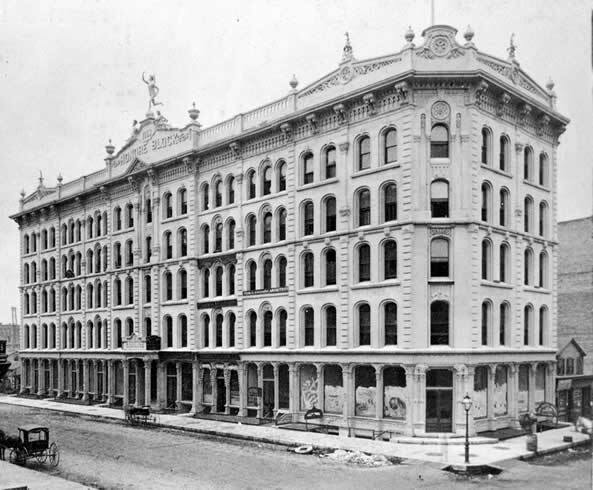 November 1, 1893 – Remaining tenants of the Honoré block at the corner of Adams and Dearborn Streets are notified to leave the building immediately as demolition work begins. Leases expire on this date, and after repeated warnings tenants finally must get out as 50 workmen have the roof off the building before darkness falls, an act that finally brings some action. “All night,” the Chicago Daily Tribune reports, “there were busy scenes about the corner, and a dozen or more tenants were hard at work in removing their goods from the building. Two or three first-floor rooms and the corner basement are occupied by saloons which were still doing business at a late hour last night, the proprietors declaring that they would continue to hold forth till the walls came down, but were somewhat disconcerted when told that gas and water would be shut off today.” [Chicago Daily Tribune, November 2, 1893] Within 60 days the building will be completely gone, and in its place will rise one of the gems of the Chicago School of Architecture, the Marquette Building of William Holabird and Martin Roche. The Honoré block with its Venetian facade fronting Adams Street begins to give way on this date so that the magnificent Marquette Building may rise.